Private consumption in Italy increased 1.4% in 2017 and is expected to grow 1.2% in 2018, with demand for consumer durables expected to grow at the same rate. In 2017 demand for household appliances declined 1.1%, and the outlook for 2018 remains subdued. Demand for furniture increased by about 2% in 2017 and should be sustained in 2018 by public incentives to support household consumption. Retailers’ profit margins are expected to remain under pressure in 2018 after deteriorating in 2017. 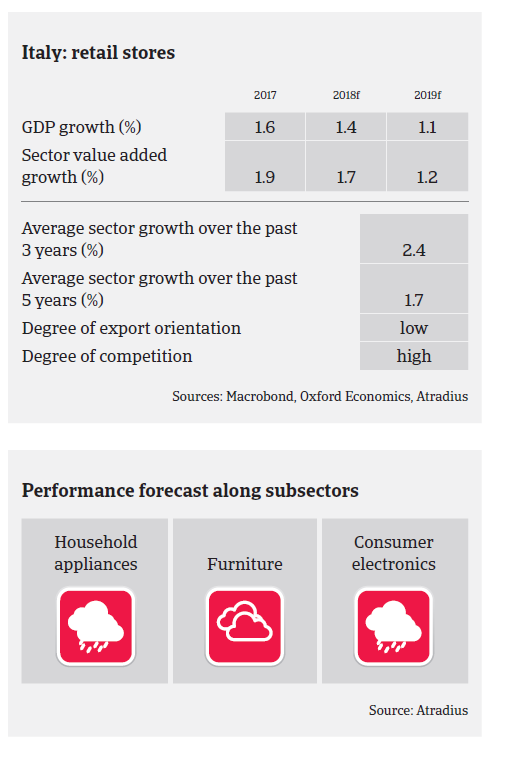 The consumer durables retail sector remains highly competitive with a high level of fragmentation, especially among small and medium-sized players. Weaker players with poor financial strength disappeared while other small businesses chose to merge with their peers in order to survive. It is expected that the current concentration process will continue, considering the smaller average size of Italian retailers compared to their European peers and high pressure from e-commerce on the margins of brick-and-mortar retailers. Payment terms generally range from 60 to 90 days on average. For businesses in the consumer durables retail sector the main source of financing is working capital. Payment delays and insolvencies increased in 2017. We expect the credit risk environment for consumer durables retail to remain challenging in 2018, with further rising insolvencies due to the ongoing competitive pressure (and liquidity issues of some players. This is in contrast to the general business insolvency development, as Italian business failures are expected to decrease 6% in 2018. Our underwriting stance for consumer durables retail is cautious, mainly with low value added distributors. Especially in the low-growing household appliances and consumer electronics segments there are many weaker players in the distribution chain that face liquidity problems and/or often lack the critical mass for long-term survival in a highly competitive environment. Some may not be able to follow the evolution of consumers demand and changing consumption patterns. That said, exports and public incentives support sales in the furniture segment.